It’s time for celebration as MacXDVD turning five! To express their gratitude to your heartfelt support these following years, they are throwing out their spectacular 5th Anniversary Giveaway with 2 of their top notch products – MacX Video Converter Pro and MacX iPhone iPad DVD Ripper, letting customers download and covery HD & SD videos, copy DVD movies to iPhone iPad for convenient playback. This hard won giveaway is now underway and will be expired on June 09th, 2015.
presets for the latest mobile phones & tablets, including iPhone 6/Plus, iPad Air 2/Mini 3, Android, Samsung Galaxy Note 4/Edge, HTC, WP8, PS4, etc. It delivers 83X faster conversion speed yet excellent output quality, even when it comes to convert 4K UHD video. The cutting – edge MacX iPhone iPad DVD ripper, originally priced at $39.95, is presented as the second giveaway gift. Participants will get the freebie on condition that they share the anniversary news on Facebook. MacX iPhone DVD Ripper is an innovative Mac DVD to iPhone ripping software to rip any DVD to a wide selection of output formats for multimedia devices like iPhone 6/6 Plus/5S/5C/5/4S, iPad (iPad Air and iPad Mini 2 included), Apple TV and iTunes. You will also get the choices to freely and easily rip DVD to MP4, H.264, MOV, M4V or music MP3, AAC, AC3 with up to 8x the real time. This Mac iPhone ripper allows you to convert both homemade and protected DVD to iPhone without sacrificing any video quality. * A 70% off MacX Anniversary Gift Pack spanning all of the functionality required for DVD ripping, video converting, audio/video streaming with minimal effort. * A half – price DVD ripper sale for movie fans in need of MacX DVD Ripper Pro full version for flawless DVD movie backup. * A software bundle containing both DVD copy software and HD video conversion software, at a whopping discount, as high as 67% off. MacX Video Converter Pro is priced at $49.95 at official page, but is current free as a result of anniversary celebration. Besides, it’s the golden chance to get MacX iPhone DVD Ripper (at list price $39.95) without spending a penny if participants share MacXDVD 2015 anniversary giveaway event on Facebook before June 9, 2015. 1. Please visit their Anniversary Giveaway Page. 2. 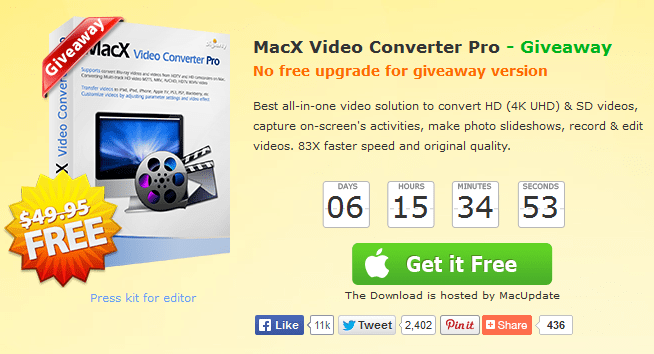 (For MacX Video Converter Pro Anniversary version) Clicking on “Get it Free” button leads to the download page. The download is hosted by MacUpdate. 3. Hit the“Download” button and you will get a 26.8 MB zip file which includes the free copy and a text (.txt) containing the license code. 4. (For MacX iPhone iPad DVD Ripper) Click “Share to Get” button. 5. Spread out the giveaway news on your Facebook. 6. The license key and download link will be showed up after sharing. Go and grab the offer before it will vanish out. Facebook Algorithm Update: How it affects Small Businesses? Thanks for the info but I am late to grab it.